LinkedIn recently made recommending your connections a lot more easy – maybe too easy, in my opinion! This blog post is about how endorsements work and how to use this new feature in a practical and professional manner. I’ll write about my opinion that it’s too easy in another post. 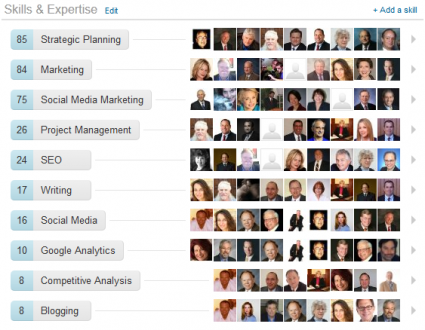 Why Did LinkedIn Add Endorsements? It used to be that the only way to provide a recommendation on LinkedIn was to go to the Recommendations option under the Profile menu, write your recommendation for someone, submit it for their review, and upon their approval it was posted. Recommendations are credible, because of this process. 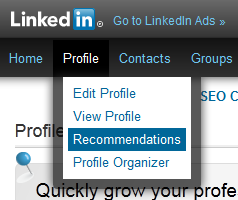 You can’t input your own recommendations on LinkedIn. Maybe that is why some of my clients went straight to my LinkedIn profile before hiring me – in one case without even visiting my website. But, who has time for writing recommendations? It takes time and thoughtfulness (if you are doing it right). So, LinkedIn decided to help us out by providing the new Endorsements feature. All it takes to endorse someone on LinkedIn is one click (and hopefully a little bit of thought). How Do Endorsements Work on LinkedIn? You can only endorse your connections. To endorse someone, go to their profile. You will probably see a message at the top that looks like the image below. If you agree with all the skills presented, click on the yellow button. If you only agree with one or two of the skills, endorse them individually. You can also scroll to the skills section of your connection’s profile to endorse them. This is a nice view (like the image at the top of this post, except there is a plus sign beside those skills you haven’t yet endorsed). It allows you to see all the skills that your connection thinks they have as well as who else has endorsed them. Here all you have to do is click on the plus sign on the left side of the skill that you want to endorse. LinkedIn will add your photo where the plus sign was. So, endorse away! It is quite easy, and with a little thoughtfulness you can help your connections out on LinkedIn. If you have questions about or need help with LinkedIn, contact me at New Incite today. I’ve been optimizing and maintaining profiles and training clients on LinkedIn for the last few years. Next post: Are LinkedIn Endorsements Too Easy?